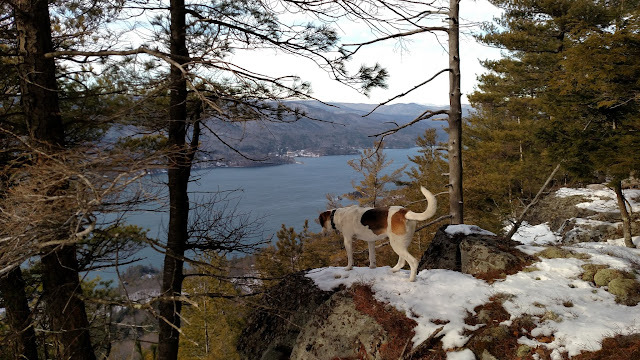 After whetting my apetite on Spruce Mountain last week, I came back for some more exploration. 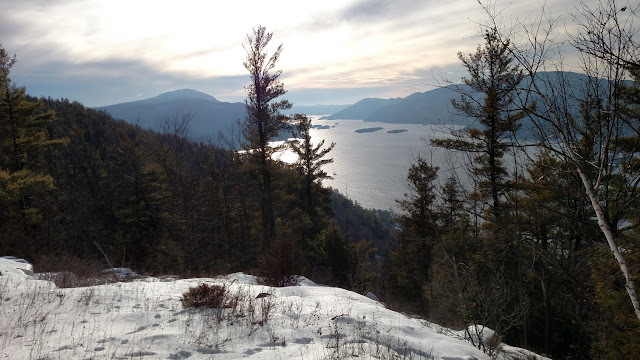 I had two goals for the day; Hogback Mountain and the trail from Spruce Mountain to the old Lake Shore Road on the East shore of Lake George. I parked at the end of the plowed portion of North Road and followed the unplowed portion over the height of land past the old building on the right (which I'm guessing was a schoolhouse). I went downhill to a cairn on the right side. 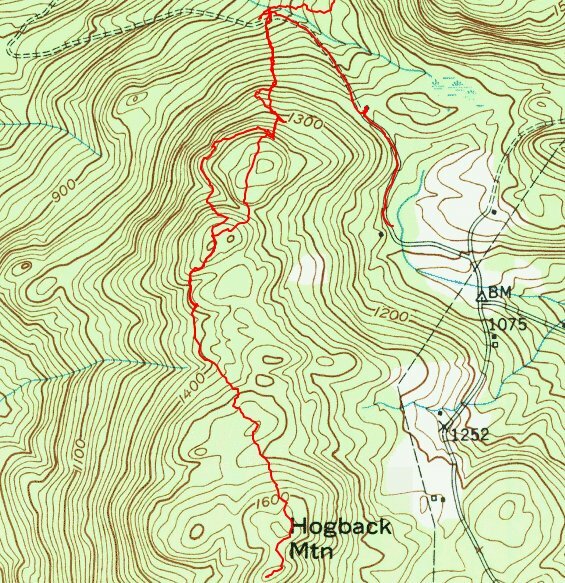 This is where the yellow disc trail comes out, and also where a white paint blaze trail on the left heads towards Hogback Mountain. This is where the yellow disc trail intersects the jeep road. 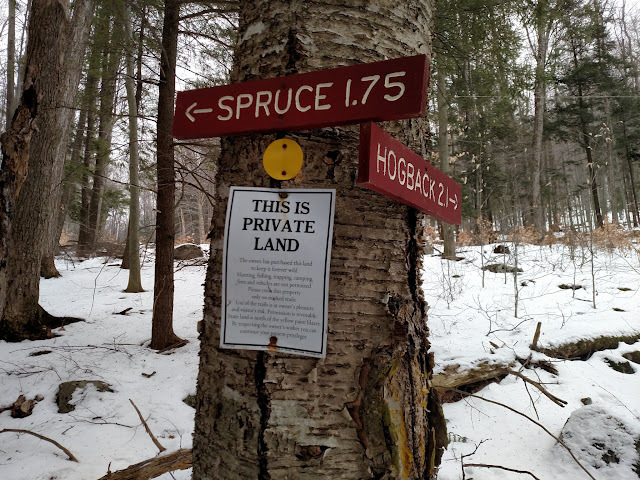 The sign at the end of the yellow disc trail said 2.1 miles to Hogback and that is where I started for first. The white blazes were easily visible and I followed them for perhaps a half mile until I came to a junction with blue blazes to the left and white blazes to the right. I chose to stick with the white blazes. Standing at the white blaze/blue blaze jct. looking at the next with blaze. The white trail contoured around the west side of a small bump on sloping rugged terrain which was icy and tricky to walk on, even with microspikes. 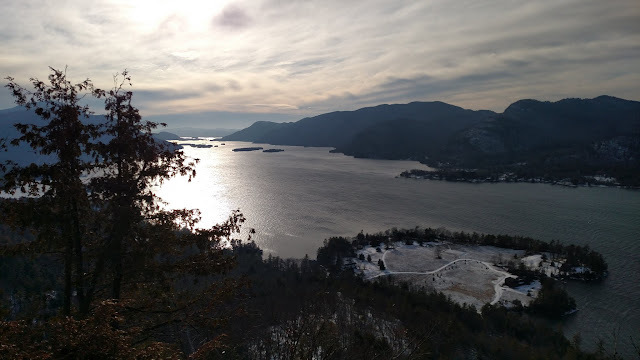 A view of Spruce Mountain and Lake George. 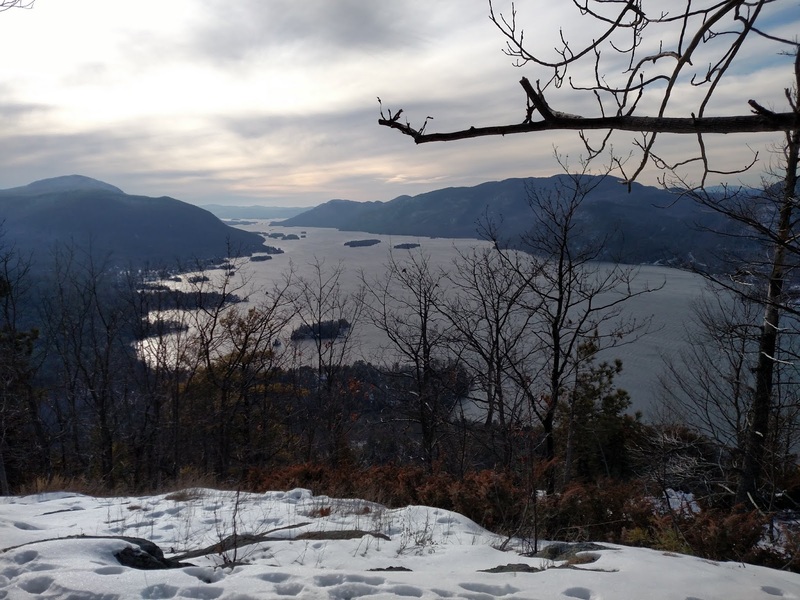 A view of Lake George from the white trail to Hogback. The white trail continued south and went over a small knoll. Soon after that, I lost the white blazes. I searched but couldn't find them. Coincidentally some old red paint was at that location, but it looked like property boundary paint. 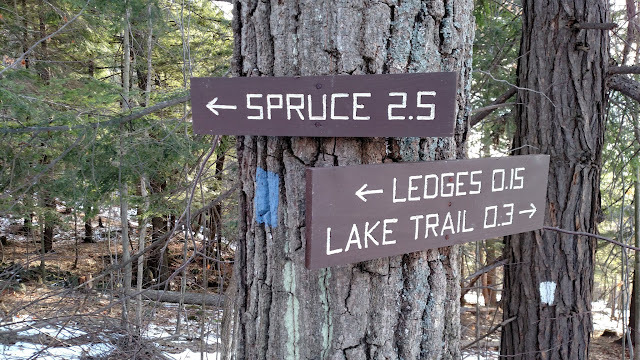 I followed the red a short distance and then picked up the white blaze again. I continued following the white, but soon lost it again. At this point, I was about a half mile from summit. 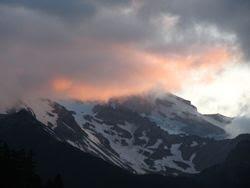 I gave up on the blazes and went to the summit where I found the blazes again. 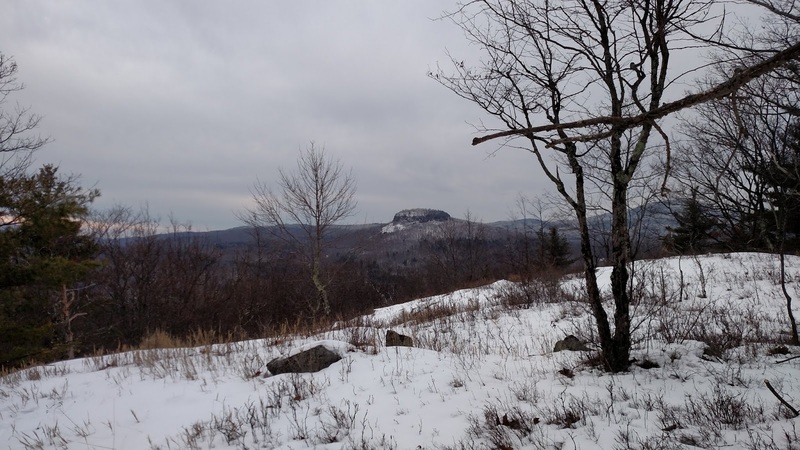 The summit is quite open, especially facing south, where there is a great view of Sugarloaf Mountain. Sugarloaf Mountain from the summit of Hogback Mountain. 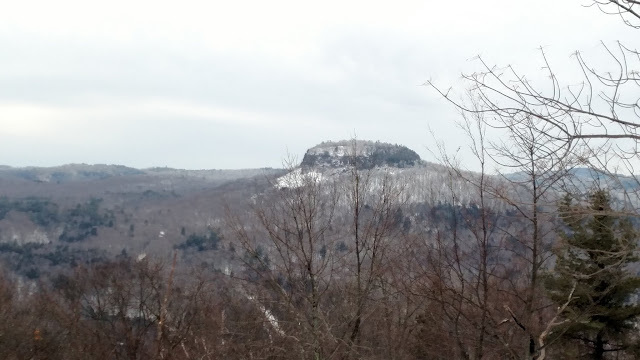 A zoom view of Sugarloaf. When I left the summit, I was able to follow the white blazes back to where I had lost the trail and then retraced my steps back to the woods road. 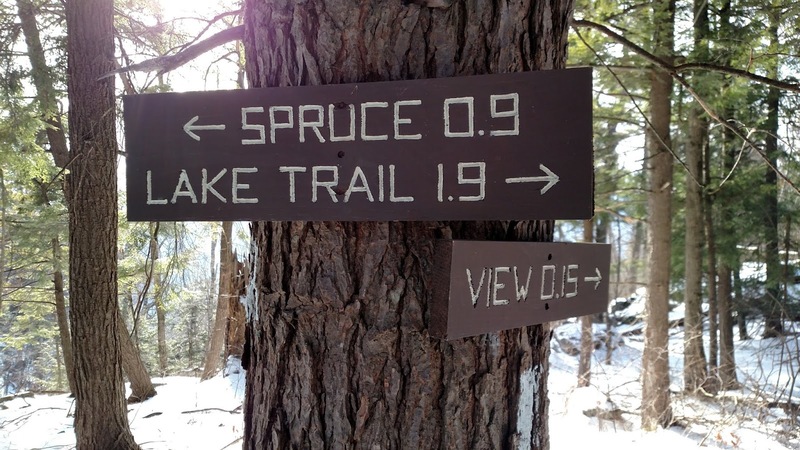 Next up was exploration north of Spruce Mountain. I crossed the woods road and started up the yellow disc trail towards Spruce Mountain. I had done this same route 6 days earlier and my tracks were still visible in the snow. The yellow disc trail ends at a white paint blaze trail which then continues all the way to the summit of Spruce Mountain. This is a very pretty route in my opinion. 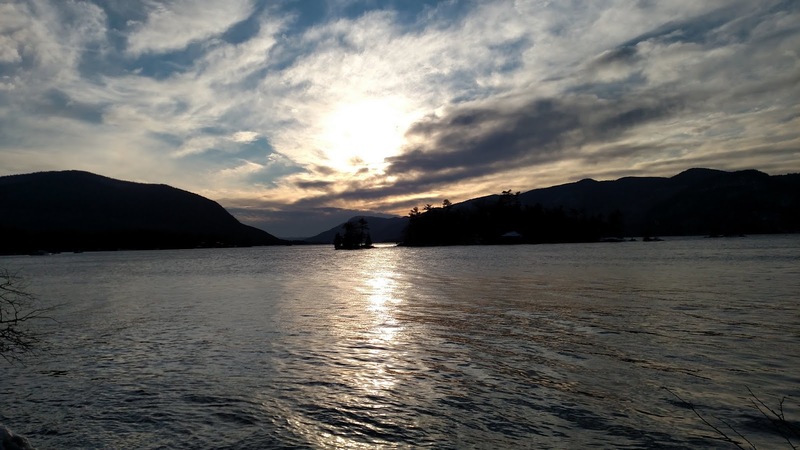 I'll be back in the summer for sure. 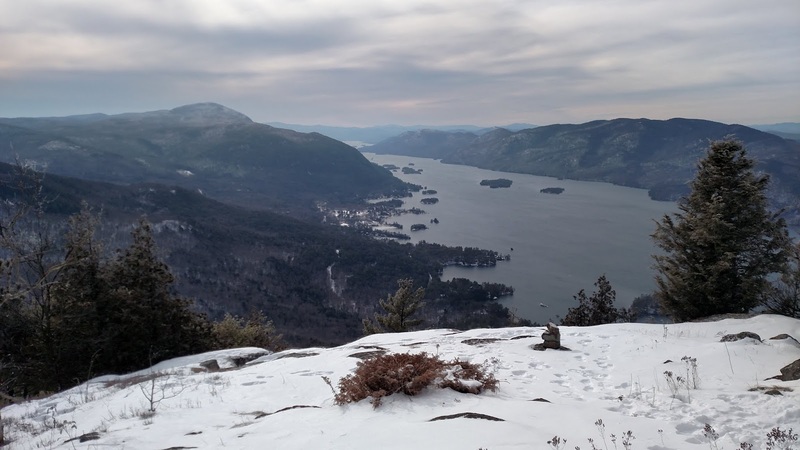 The awesome view from near the summit of Spruce Mountain. Last week I went to the summit, but failed to notice that the white blaze trail continued north; hence the need for a return visit. If you continue northward, hugging the western edge of the ridge, you'll see that the white blazes continue. From Spruce Mountain north was new for me. The trail starts dropping down off the summit, then turns abruptly to head SW to to avoid some steep terrain. Another switchback turned the trail back in a northwesterly direction. Next I came to what appeared to be the remnants of an old logging road. The white blazes became few and far between. At one point, I lost them, but discovered the trail had turned in a westerly direction. Soon after that, I came to the sign pictured below. 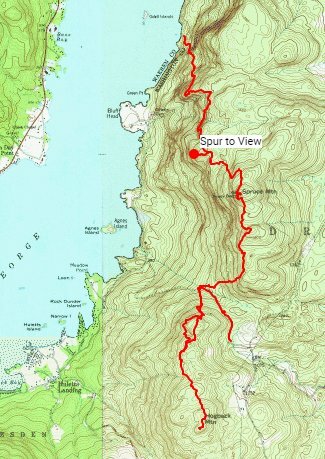 I chose to take the spur trail (marked in blue paint), to the view. The view from the spur trail. 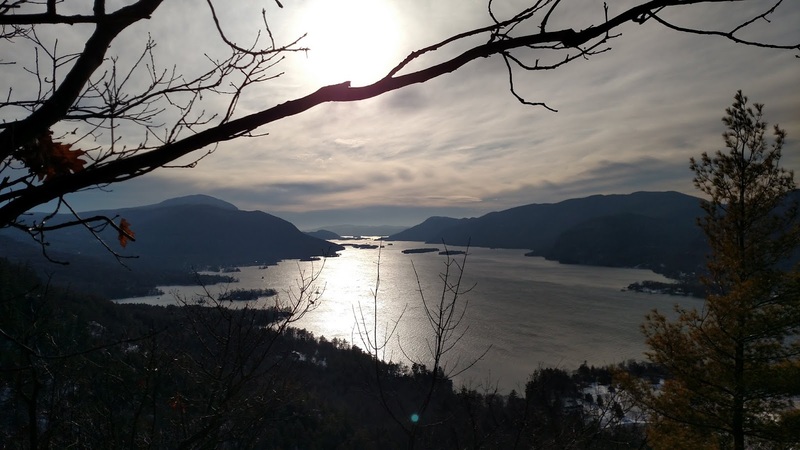 The spur led to a ledge that offered a great view south on Lake George. I could can see all the way through the Narrows to Montcalm Point and beyond. 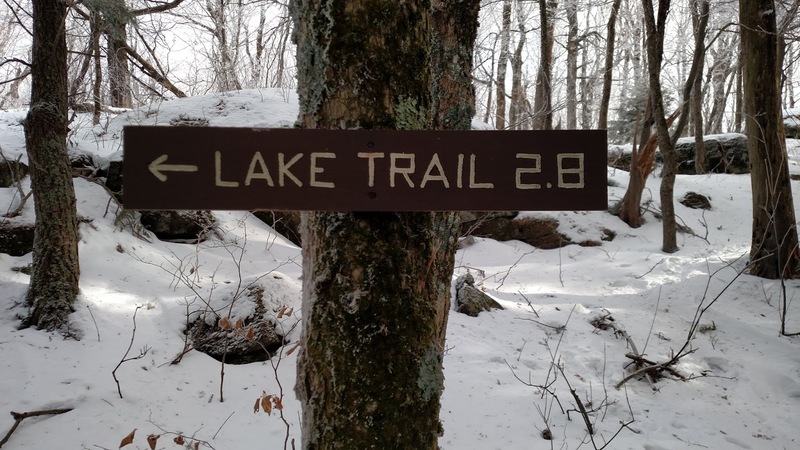 I returned to the white trail and continued north. The trail hugged the edge of a ridge with a very steep dropoff. It also sloped towards the dropoff. I move slowly in my microspikes. They weren't always gripping well on the snowcrust that was covered with 3" of snow. I made sure my dog Rev stayed away from the edge as well. Rev's last look over the edge before I moved her away from the sloping terrain that followed. The trail continued north along the ledge for what seemed like forever. 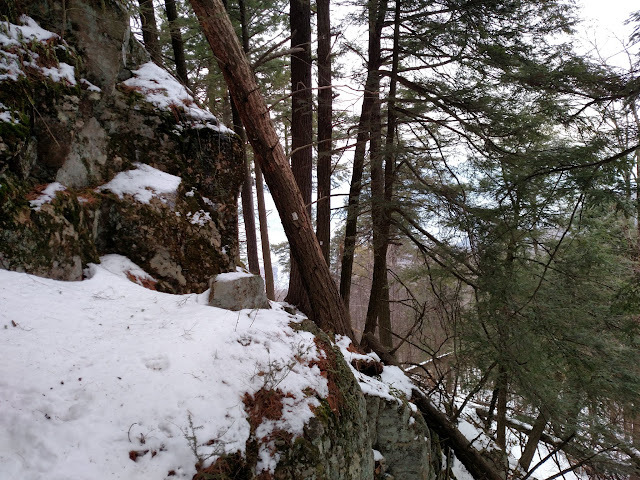 Finally the ledge ended and the trail made a sharp turn west and started dropping down a ridgeline. 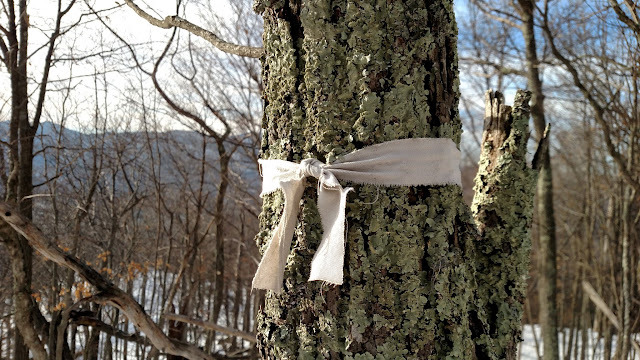 The white blazes ended, but white cloth ribbons were tied on the trees. 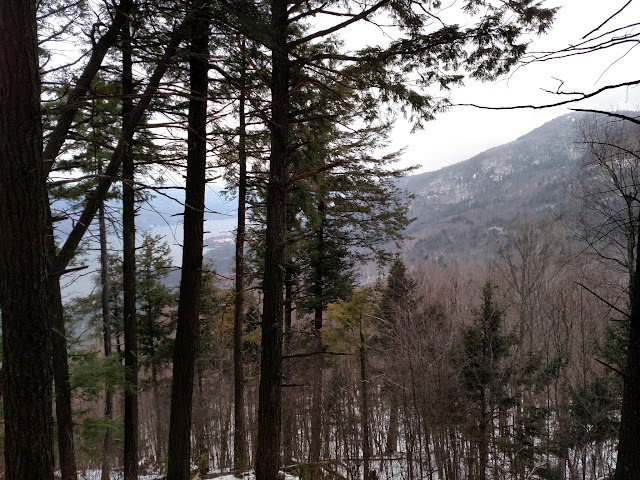 I descended the ridge to another viewpoint and a cliff. The trail turned north again and I followed the ribbons which soon changed back to white paint blazes. The white ribbons replaced the blazes for awhile. I came to another junction with a spur trail leading to yet another ledge. Again the spur trail was marked with blue blazes. The ledge looked promising, but I was starting to get concerned about time. It was now about 2 PM and I still had to go all the way back. I bypassed the spur trail and kept going. 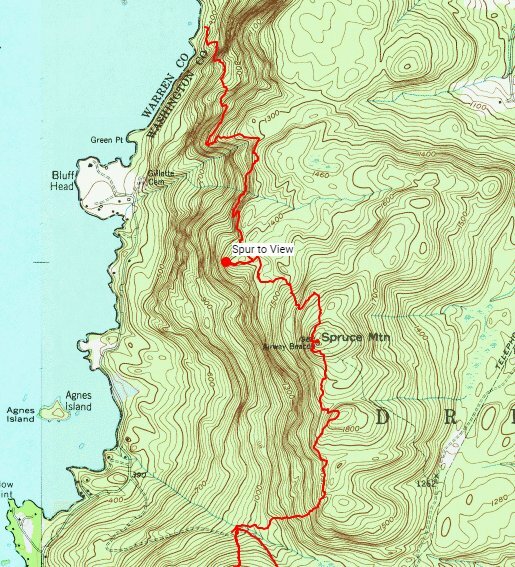 Another spur trail in blue paint. 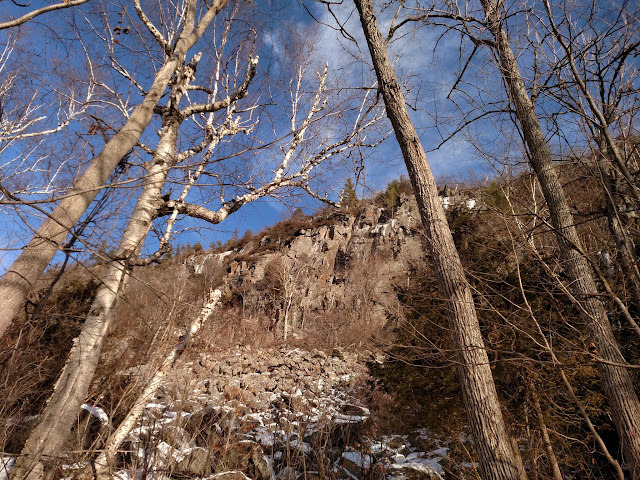 As I got down lower I had a great look back up to the ledge from the 2nd spur trail. It was pretty impressive looking. The ledge reached by the 2nd spur trail. 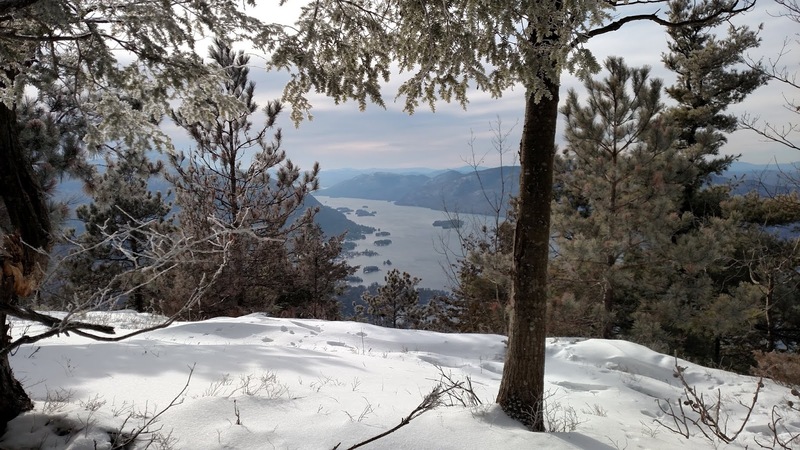 Finally the white trail reached the old abandoned Lake Shore Road at a location just SE of Odell Island on Lake George. 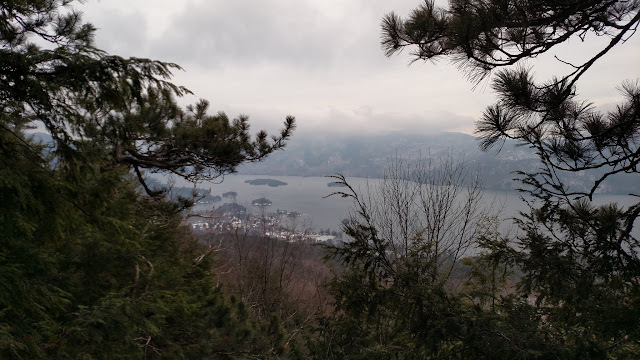 I walked the old lake road for a couple minutes to see what it looked like, but unfortunately I had to shift into high gear to get back before it got dark. I retraced my steps and reached the car feeling pretty worn out. 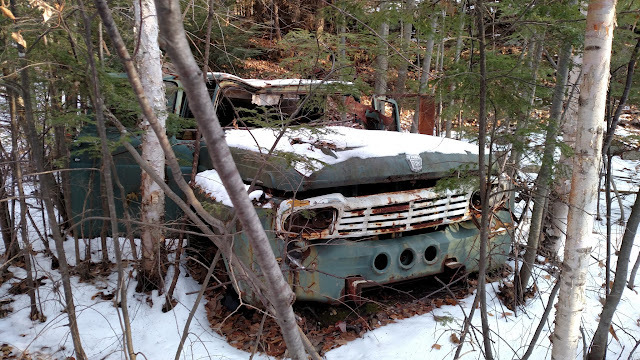 The old abandoned Ford pickup truck visible from the Lake Road. Do you post the *.gpx files for these? I would like to have these particular files if possible. Since this trip was partly on private property, I prefer not to post a track. There is signage allowing hiking though ( as you can see in the first picture).